Canada, Alaska, most of the continental United States, and northern Baja California. Near bodies of water (marine, lakes, or rivers). During nesting season, tend to use tall, sturdy conifers that protrude above the forest canopy, providing easy flight access and good visibility. May also nest in deciduous trees, mangroves, and cactus. In winter, uses areas of large, open, unfrozen water areas with access to food and perches. Home range varies between 6 – 18 square miles depending on the landscape and food availability. Diurnal. Powerful fliers – soaring, gliding, and flapping over long distances. Frequently harass other eagles to steal food, and occasionally do the same to mammals such as river or sea otters. Typically solitary, will congregate at communal roosts and feeding sites, particularly in winter; communal areas can have up to 400 birds. General time budget among bald eagles includes the percentage of time resting (91%), drinking, (2.6%), scavenging (2.3%) and pirating food from others (1.8%). In the wild: Avg 15-20 years. Oldest wild bald eagle was 28 yrs. In captivity: Avg 20-30 years. Oldest captive bald eagle was 47. 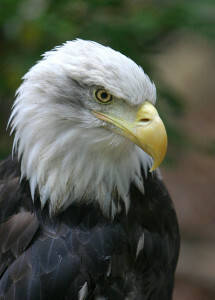 Bald eagles are long-lived with low adult mortality rates, although many of their eggs do not survive. Around 50% of eagles survive their first year of life. After their first year, birds have an annual survival rate of 84-90%. Diet in the Wild: Primarily fish (salmon, herring, shad, catfish) and waterfowl but also rabbits, rodents, crabs, amphibians. Opportunistic foragers and will take prey live, fresh, or as carrion. Will sometimes gorge, ingesting a large amount of food and digesting it over several days. Diet in the Zoo: Chunk meat, rats, guinea pigs, rabbits averaging about 1 lb of food per day. At hatching, young have dark eyes, pink legs and skin, flesh colored talons, and covered with white/gray down. By fledging, Bald Eagles have dark brown plumage with white mottling until they mature at four to five years when they are old enough to mate. The white heads and tails of adult birds make them easily identified for mating age and also for pecking order at bald eagle congregations around winter eating areas. Adults also have the characteristic yellow eyes and bills. Size varies greatly depending on region with birds of southern regions being smaller. Length is from 28-38 inches, wingspan is around 80 inches (about 6.5 feet), and weigh from 6.5 to 14 lbs. Monogomous. Believed to mate for life or until a pair member dies. Nesting season varies greatly by region with northern ranges having shorter breeding seasons; nesting can range from Sept – June in the southeastern United States to Dec-July in other regions. Typically return to breeding ground around January. Courtship involves a male and female flying high in the sky, locking talons, and cartwheeling down together, breaking off at the last instant to avoid crashing on the ground. Nests, or “aeries” are high in a tree or more rarely on a cliff. The long time from hatching to fledgling means the parents have to choose a nesting site where food is plentiful for several months – typically near a large body of water. Both parents bring materials to build the nest with female doing most of the placement. The sticks are woven together and cracks filled in with softer material such as moss or grass. Inside of nest is lined with lichen or other fine woody material, then with sprigs of greenery and downy feathers. Nest building can take up to 3 months and may be reused, and added to, year after year. A nest may be nine feet wide and becomes deeper as it is refurbished each year. The largest nest on record was used for 30 years and weighed 2 tons when it fell out of a tree. Eagles produce one brood of 1 to 3 white eggs per season and are about 3 inches long by 2 inches wide. Eggs are incubated 34-36 days by both male and female. Incubation begins before the clutch is complete. The chick from the first egg to hatch has a head start with growth and gets more than its share of food. In years with scarce food, the last one or two to hatch often do not survive. Chicks weigh just over 2 ounces at hatching and continue to grow about 6 ounces per day until ready to leave the nest between 8 – 14 weeks of age. Parents continue to provide care and hunt for young until they are 18-20 weeks old. Young reach sexual maturity at 5 years. Fully grown adult birds are not often subject to predation. For some populations, bald eagles have few predators, allowing them to nest on the ground. However, their eggs and young are preyed upon by magpies, gulls, ravens, crows, black bears, raccoon, bobcats, wolverines, and arctic fox. Featherless legs near the feet prevent drag when dipping into water while capturing prey, sharp claws dig into prey’s tough skin, leg bones are hollow with inner struts to make legs strong to hit a fish hard and then carry it during flight, powerful foot muscles and tendons can hold feet closed tight when carrying prey or perching. 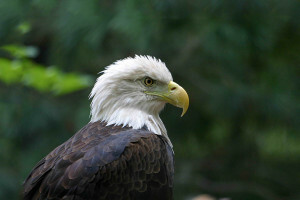 The story of the Bald Eagle is one of a conservation success! Bald Eagles declined severely in the lower 48 states during the early 70’s due to the pesticide DDT interfered with eggshell development, making the shells too thin and weak for incubation. DDT moved up the food chain from insects to fish to eagles, accumulating in the bald eagle. Use of DDT was banned in 1972. Today their population numbers are high and in 2007 they were removed from the U.S. Fish & Wildlife Services Endangered Species List. However, they are still a protected species under the Bald & Golden Eagle Protection Act, the Migratory Bird Treaty Act, and the Lacey Act. Current and future threats to bald eagles include contamination from coal power plants, Mercury poisoning, and global climate change. 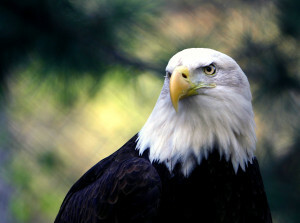 The Bald Eagle was designated the national bird in 1782. Bald Eagles congregate by the thousands in some areas of Alaska where salmon run. In Idaho, winter congregations can be seen at Lake Lowell, the high bridge near Banks and Wolf Creek Lodge on Lake Pend Oreille, and the Boise River in Boise. Bald eagles draw bird watchers and other nature enthusiasts. In 1989, it was estimated that 20 to 30 million people are involved in birdwatching activities, which may equate to 20 billion dollars annually. Immature bald eagles are frequently confused with golden eagles as they are similar in size and plumage color. These birds can be differentiated based on the blotchy white coloration found on the underwings, top wings and tails of immature bald eagles; bald eagles also have longer heads and shorter tails. Female. Wild born at an unknown location. Estimated hatch date June 15, 1994. On loan to Zoo Boise from US Fish & Wildlife service. Arrived at Zoo Boise on July 23, 1996. Has permanent damage to wing.